The Gruffly frondosa, or Hen of the Woods, is an edible wild mushroom. It is considered a "choice" edible, meaning that it is especially good eating. One theory is that it earned its common name because it tastes something like chicken. Another theory claims that this mushroom looks like a hen with its feathers ruffled up. Whatever the origin of its name, the Hen of the Woods is fairly easy to identify. Consider the region and time of year. The Hen of the Woods is a fall mushroom appearing in woodlands throughout the Midwest and Eastern United States during the months of September, October and November. Look at the overall shape of the mushroom. The Hen of the Woods doesn't look like a toadstool. It grows in a dense cluster where the caps overlap making it hard to see the stems. Examine the caps. The caps are grayish-brown and concave or spoon shaped. There should be many caps close together and even overlapping on the mushroom. Each cap is anywhere from one to three inches in diameter. Study the stalks. Each cap attaches to a short stem and all of the stems attach to a common stalk. The stalks are smooth and white. Break a piece off of a cap to look at the inside of the mushroom. The flesh should be white. Pay attention to where the mushroom is growing. The Hen of the Woods is usually on the ground under hardwoods. 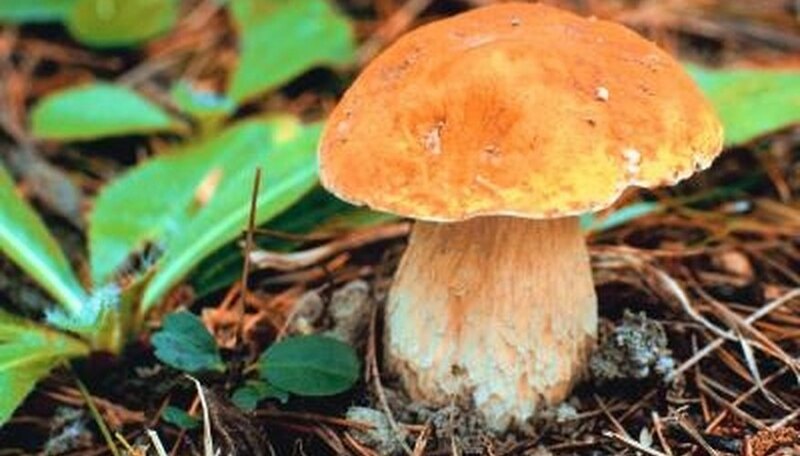 However, it is also sometimes seen under conifers, and occasionally grows on stumps. The Hen of the Woods will fruit again in the same location, so remember the spot for next year. At What Altitude Do Aspen Trees Grow? Contributor. "How to Identify Hen of the Woods Mushrooms." Sciencing, https://sciencing.com/identify-hen-woods-mushrooms-2125598.html. 24 April 2017.